Somebody reminded me the other night I once said "Greed is good." Now it seems it's legal. The richest one percent of this country owns half our country's wealth, five trillion dollars. One third of that comes from hard work, two thirds comes from inheritance, interest on interest accumulating to widows and idiot sons and what I do, stock and real estate speculation. It's bulls--t. You got ninety percent of the American public out there with little or no net worth. I create nothing. I own. We make the rules, pal. The news, war, peace, famine, upheaval, the price per paper clip. We pick that rabbit out of the hat while everybody sits out there wondering how the hell we did it. Now you're not naive enough to think we're living in a democracy, are you buddy? It's the free market. And you're a part of it. You've got that killer instinct. Stick around pal, I've still got a lot to teach you. Welcome to the world of cheap and easy money. It's a time where asset bubbles get inflated, deflated, and reflated again and again until the value of money becomes meaningless. It's an environment defined by zero interest rates, trillion-dollar deficits, and currency debasement. It's a world where real values get inflated until value has nothing to do with hard work or the creation of productive goods and services. It's all about speculation, a liquidity-driven market swarming around the globe looking for returns and a temporary place to land. Such is the beginning of all great inflations. This is the environment we inhabit today: where markets are driven more by perceptions than by reality or facts. Two of the biggest perceptions today are first, that the stock market is headed for a crash and second, that the world, in particular the United States, is headed for deflation. I don't have a crystal ball, but experience tells me that when everyone is leaning to windward it's time to cross over to the leeward side of the boat. Let's take the first perception: that we're headed for an immediate stock market crash. You've seen the headlines recently: the "Hindenburg Omen," the infamous "death cross," and other perils presaging impending doom. I've seen a plethora of forecasts prophesying everything from Armageddon to the end of mankind and the markets. "Dow 500," "Dow 1,000," take your pick. There are plenty of predictions to match any psychosis, neurosis, or any other depressing malady conjured up by one's own predisposition to doom. A good example is recent history. 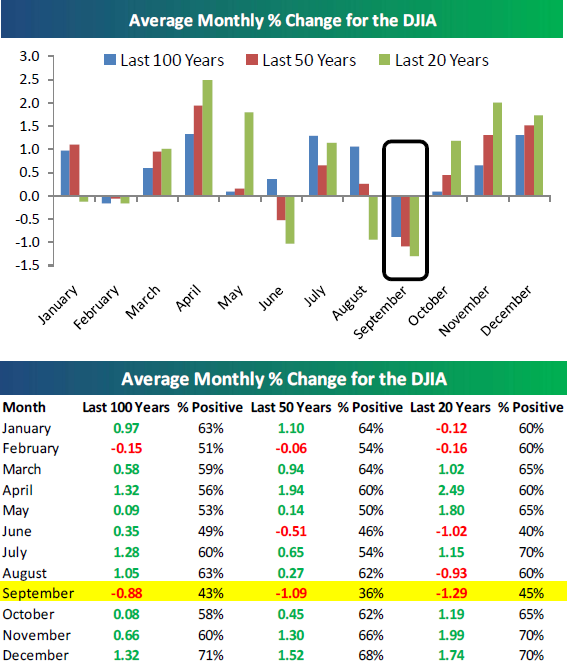 Historically, September tends to be the worst month of the year for the stock market's performance—the other being October, the month when most stock market crashes occur (think 1929, 1987, 1989, and 2008). In preparation for another impending mid-Fall disaster, investors have headed for the sidelines. Money was beginning to flow back into the market until the "Flash Crash" on May 6th of this year. There have been a number of explanations given for the temporary glitch including everything from the "Fat Finger Theory," to "High Frequency Trading," to "Large 'Directional Bets,'" to simply technical glitches. Regulators have disproved the Fat Finger Theory. They rejected High Frequency Trading. Some investigators suggest that a large purchase of put options on the S&P 500 Index by a large hedge fund shortly before the crash may have been among the primary causes. One can debate endlessly as to the cause of the Flash Crash. Suffice it to say it helped to destroy still-fragile investor confidence and reinforce investor angst over another possible equity storm. However, instead of crashing further, stocks did the opposite: they rallied, giving us one of the best Septembers in recent memory. Could we see a correction? It's a likely possibility. Nothing goes straight up indefinitely. In this event-driven market where investors convictions are paper-thin, money can turn on a dime. That is the nature of all speculations in times of easy money. The trick is to figure where the next bubble is going to emerge. An old adage that "Generals are always fighting the last war," can equally be applied to today's investment climate. Investors are going to great pains to avoid the most recent disaster in the stock market, the crash of 2008-2009. Today's behavior by investors, which focuses considerably on short-term events, is nothing more than an extrapolation of the volatility of the credit crisis and the Flash Crash. As the Investment Company Institute (ICI) recently reported, year-to-date net inflows into taxable and tax-free bond funds totaled $185.6 billion through July ("Trends in Mutual Fund Investing," July 2010). It is estimated that inflows into bond funds over the last three years since the Fed began slashing interest rates and the credit crisis began have totaled more than half a trillion dollars, with close to $300 billion flowing into bonds in the last twelve months alone. Retail investors' risk tolerance in recent years has flattened out or dropped across all age groups according to the ICI. This is reflected by the move out of stocks into cash and bonds. While investors may be focusing on avoiding the most recently made mistakes, they have few qualms about repeating mistakes made from times past: over-invested in techs in 1997–2000, real estate 2004–2007 and now bonds in 2009–2010. What today's investor doesn't see is that big money can be lost in the bond market, as shown in the graph below. When the bond vigilantes return and wake up to the fact that paper wealth is being sheared by our current Money Master and Commander Ben Bernanke, higher interest rates and falling bond prices will be the consequences. I'll have more to say about this topic in a moment. I believe that we are in a long-term secular bear market in stocks. 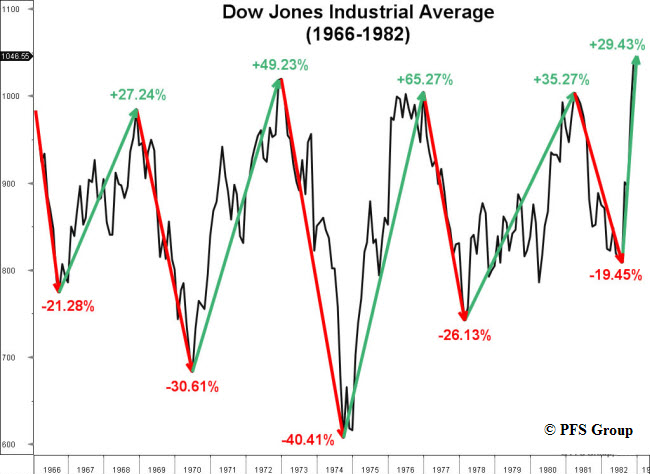 However, within the context of a secular bear market there can be shorter intermediate cyclical bull markets as shown in the graph below of the Dow between 1966 and 1982. This intermediate-term move will end some day but I don't think we're there yet. There is plenty of liquidity, interest rates remain at historically low levels, and there are no more rules regarding monetary soundness. The rules keep changing as my friend George Karahalios keeps pointing out. There are no limitations to the amount of money that can be created. All the market needs is a catalyst to send stock prices higher despite the dismal economic news. There are a number of catalysts out there that each alone could do the trick. One is a political change that, come this November, would create gridlock in Washington or at least stop the unstable policies currently being pursued by our current political leaders. Related to gridlock would be an extension of the Bush tax cuts for all taxpayers for at least another year and, most probably, until after the 2012 presidential elections. There seems to be growing momentum within both parties given the failure of the recent stimulus efforts and the weakening trend in the economy. 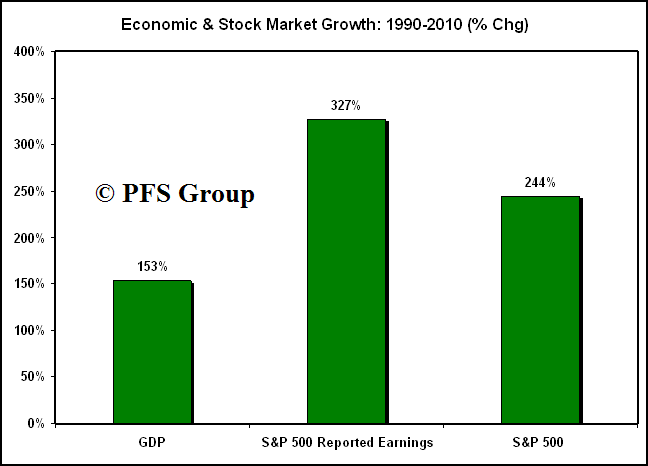 Stocks can rise even in a weakening economic and profit environment as shown in the graph below. In addition, US bank credit and broad money are growing again, albeit at a 6% annualized rate since June. The commercial paper market also is showing signs of life again. It is also important to understand that banks only account for less than 30% of all credit creation. Close to 70% of credit comes from foreign financial institutions, life insurance companies, money market funds, pension funds, mutual funds and other non-banking entities. Joe Sixpack and Larry Lawnmower may not be big borrowers, but large corporations are, as well as the biggest borrower of all: Uncle Sam. Large corporations and the government alone have the means to move the markets. Companies are sitting on large stockpiles of cash, some of which is overseas. Companies can do many things with that cash. They can build new factories, hire new workers, or pay big bonuses to employees. Given anemic demand in the U.S., it is unlikely they will build new factories or hire new workers, given all of the political uncertainty regarding taxes, regulations, and the outcome of recent healthcare and financial legislation. They are less inclined to pay out big bonuses (unless it's a Wall Street investment bank). So that leaves only three other options: they buy back shares, buy other companies, or increase their dividends. Investors don't invest in stocks to accrue large unpaid cash balances. Investing in stocks is all about return on equity and total return. Companies that sit on large cash balances risk seeing their own cash being used by a larger predator to take them over. They can buy back their own shares, as many tech companies' CEOs have been inclined to do over the last decade. This strategy has gotten them nowhere. As a recent article in Barron's by Andrew Bary points out, Cisco spent close to $65 billion buying back its shares over the last decade, retiring 3.1 billion shares at an average cost of around $20.78—very close to where Cisco's shares trade today ("Techs' Payout Problem," 11 September 2010). According to Bary's calculation—which assumes no reduction in share count due to the buybacks—that $65 billion would have amounted to around $7 a share in dividends. The cash hoarding by major companies amounts to a stranded asset. Bary goes on to hypothesize what could happen if tech companies began to mobilize that cash in the form of dividends to shareholders. Have a look at a chart from his article below. I would agree with Bary that share prices and investors would be better off with dividend payouts and increases than share buybacks, especially in a risk-averse world. 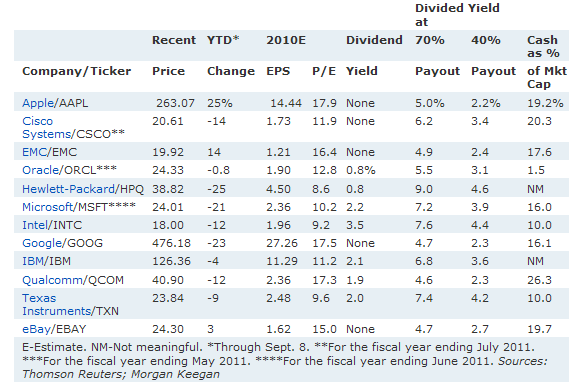 Who wouldn't want to own Cisco, IBM, or Microsoft with dividend yields of 3–4%? 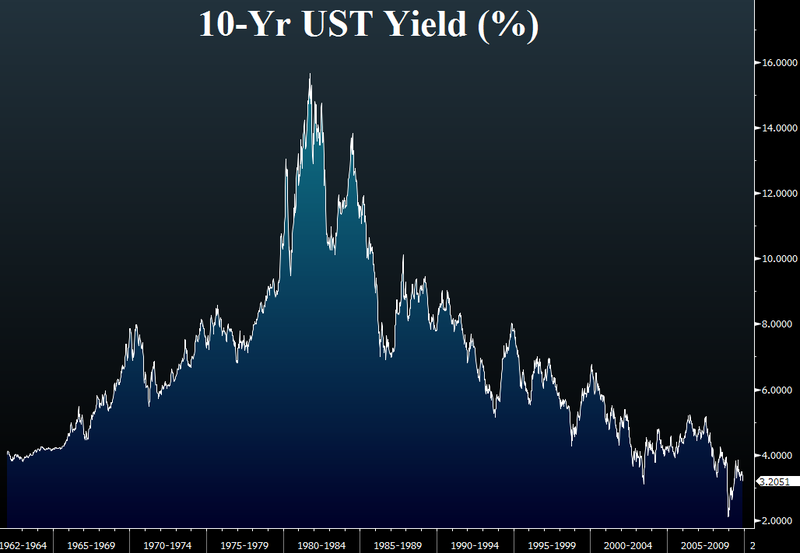 Compared to treasuries paying 1–2.5%, it would be an attractive alternative. Tech CEOs must have read Bary's article because several of these same companies listed above have made recent dividend announcements, including a few such as Cisco, which have never before paid a dividend. What we are seeing today is that relative to bonds, US stocks are the cheapest they have been in nearly half a century. It harkens back to the 1930s through the 1950s when dividend yields were higher than bonds due to perceived risks resulting from the Great Depression and the Great Bear markets of 1929–1932 and 1937–1941. Recently we have seen high correlations between all asset classes. Much of this is due to investors' short-term focus and their desire to avoid all forms of risk. However, close correlations among all asset classes don't last forever. The mispricing created by high correlations will eventually be exploited once money begins to arbitrage those misevaluations. That means it's time to move on to the next perception, which is money and the perception of deflation. The second biggest (mis)perception is the widely held belief that the world, in particular the United States, is headed for deflation. Views on deflation run the gamut from mild deflation such as we've seen in Japan, to severe deflation as experienced by the U.S. during the Great Depression. The problem of addressing the issue of deflation is that it is wrapped up in defining its meaning. Webster's used to define "deflation" as a lessening of the amount of money in circulation, making it rise in value. The definition of deflation and inflation has changed over time. Today most economists, economic textbooks, and even dictionaries define deflation/inflation in terms of their symptoms not their causes. The modern definition of deflation has come to be understood as a decrease in the general price level of goods and services. Likewise inflation has come to mean a rise in the price of goods and services. There are other distortions that are widely used when describing what occurs in financial markets. Rising stock or asset prices are referred to as bull markets, while falling stock and asset prices are cited as deflation. Unfortunately, these modern definitions are not consistent with each other, or with the causes of some of these price changes themselves. I prefer the older definition of inflation/deflation as being connected to the supply of money—in other words, to the cause of changes in price rather than to the symptom of changes in price. Under our current system of fiat paper money, where the monetary unit is nothing more than a piece of paper stamped and sanctified by government officials, the monetary unit has no intrinsic value. Its only value is determined by the faith of the public in the issuing government; this "faith" in the monetary system allows an arbitrary, value-less monetary unit to "pass" as having value. Especially during this era of "digital money," there is no limitation to the creation of monetary units. Under our present fiat-based system, the increase in the quantity of money is limited only by the self restraint of government officials. Hence, as the quantity of money increases more rapidly than the supply of goods and services, the result is higher prices. Therefore such a monetary system virtually guarantees that prices will rise over time. During a deflationary period, the quantity of money falls, it becomes difficult to obtain credit, and businesses and individuals find it necessary to hold large cash balances in order to be sure of being able to meet their obligations when they come due. Under these conditions, there is a corresponding reduction in the velocity of money, or the rate at which money changes hands. The classic economists and economists from the Austrian school clearly understood the cause of inflation/deflation to be a monetary one. The monetary school founded by Milton Friedman also understood this concept. Today the general understanding of the meaning of inflation and deflation is convoluted by widespread distortions as to the cause of inflation or deflation. Put simply, inflation and deflation are manmade. Inflation is caused by an expansion of the supply of money in an economy while deflation is caused by a contraction of the supply of money. The end result, respectively, is either rising or falling prices which are symptomatic expressions of the expansion or contraction of the money supply. Inflation is manmade; specifically it is created by government. When its symptoms start to express themselves in higher prices, governments need to find a culprit or scapegoat—other than themselves—as to its cause. Rising prices are often blamed on greedy businessmen wanting to make more profit (think oil companies); this is referred to as "profit-push inflation." Then there is "cost-push inflation" frequently attributed to arbitrary demands of labor unions. There are variations of "cost-push" inflation such as "crisis-push" or "acts-of-God" inflation caused by events such as the Arab oil embargo of the 1970s, or by more recent tragedies such as floods, hurricanes, or other acts of nature. In the case of deflation the commonly blamed bogy is banks' unwillingness to lend or corporations sitting idly on piles of cash. The result is the same: governments need to find scapegoats and deflect blame from their money-printing schemes. Inflation/deflation is as old as man. Jens O. Parsson in his book Dying of Money: Lessons of the Great German and American Inflations (1974) expressed the matter succinctly. A few more particulars before a conclusion on the issue of inflation/deflation can be reached. We've discussed that inflation and deflation both have a monetary component (the cause: the supply of money as described above) as well as a price component (the symptom: the money price of things that people buy). Yet how is it that increases in money supply don't always immediately result in increases in price? To understand this time-delayed relationship, it is important to understand how changes in money supply move their way through the economy. There are three variables at work when it comes to prices of goods and services. They are money supply, money velocity, and the supply of real values ("real values" is just another way of saying "goods and services" or simply "stuff"). Of the three variables only money supply is subject to the control of government. If buyers and sellers of goods do not react to the increase in the supply of money, then prices will not immediately rise, all other factors being equal. If individuals hold on to that increase in the supply of money, then velocity, the turnover of the supply of money, does not expand—temporarily nullifying the effects of the extra supply of money. This can often happen after a severe financial shock or economic event that causes individuals to prefer holding on to cash. A good example is the recent credit crisis where the credit system locked up. Credit was hard to come by so businesses hoarded cash, which caused the velocity of money to fall. Price inertia can also be a temporary factor delaying future price increases. If the sellers of goods are passive about raising prices, such as in a recession where the fear of higher prices may lead to lower or lost sales, or if buyers are willing to hold their excess money rather than spend it bidding up prices, then prices may temporarily remain steady. In a study of the Great American and German inflations, this is exactly what occurred in response to initial waves of monetary inflation created by the German and American central banks. Prices initially remained steady; the shock of war or the shock of a recession, or the severe stock market fall caused a preference for cash which in turn depressed money velocity. Now back to that part about "stuff" or "goods and services." There are other aspects about inflation and deflation that are needed in arriving at our conclusion regarding whether the U.S. is headed for inflation or deflation. It can also go into financial assets (stocks, for example) or paper wealth (debt instruments such as bonds, notes, mortgages, and other credit instruments) causing their respective prices to rise, as they are doing today. Speculation in paper investments helps to ameliorate the price inflation of the actual "stuff" noted above, since the extra money is being used to speculate on assets rather than to buy "things." For this reason, the stock market itself (as is the bond market) is a principal relief valve concealing latent inflation pressure. For example, when the Fed announced quantitative easing in March 2009, the first beneficiary was the stock market/investment market, and the price of most financial and hard assets such as precious metals and commodities all rose in response. The significance of the financial markets is that they are a principal repository of potential inflation. The market acts as a shock absorber to any increase in the money supply. However, once money leaves the financial markets, it goes elsewhere; if it goes into "things," then the prices of those "things" increases. Today the principal depository of the Fed's monetary inflation is the bond market, specifically government bonds. In fact the profusion of paper wealth (debt instruments) currently constitutes the single largest reservoir of latent inflationary wealth. This debt doesn't represent "real wealth." A nation's wealth does not increase just because its debt levels increase. That debt is a liability against real values. The government can immobilize the latent inflationary effects represented by this paper wealth only as long as its debt instruments retain their credibility. In order to stave off movement away from these "latent reservoirs of inflation," the government plays a confidence game with the holders of paper wealth. So long as confidence is maintained things go well. The minute confidence is eroded, there is an exit out of this paper wealth and the full force of its latent inflation is unleashed upon the financial markets and the economy. Think Greece and PIGS. This is the very reason why central bankers always conduct propaganda campaigns to assure the holders of paper wealth that they will remain vigilant for any signs of inflation and take immediate action. This is done to lull paper wealth and keep it complacent. Because once the bond market and holders of debt instruments lose confidence in government paper, the full force of this latent inflation of the wealth held in these instruments is unleashed. Bond values plummet, causing interest rates to rise, and money flees to where it can best maintain its value. This explains a major reason why we've seen the price of gold rise steadily every year since this decade began. In summary, before I conclude I refer again to Jens O. Parsson, who clearly understood financial and paper wealth as a depository of latent inflation. Inflation, on the other hand, invariably stimulates a tremendous expansion of paper wealth in relation to real wealth. Government debt grows excessively, and private debt grows even more excessively. This colossal expansion of paper wealth is the most powerful single influence for absorbing, moderating, and containing inflationary force. On the other hand, the existence of this overexpanded paper wealth supplies the principal compulsion upon the government to inflate anew so as to erode the real value of the paper wealth continuously to manageable levels. A man who watches for inflationary storms must keep a weather eye on the paper wealth. As illustrated we can see that there are vast reservoirs of latent inflation that lie dormant in today's rising inflows into bond markets. When money is created it has several outlets to flow into: real goods, financial assets, and paper wealth. We so often mistake a rise in either financial assets or paper wealth as a bull market. If the money flowing into these areas came from savings, resulting from the production of real goods, there wouldn't be a problem. But when this money is artificially created, as it is today by central banks expanding their balance sheets, inflation not deflation lies in our future. These depository reservoirs are only a temporary shock absorber ready to unleash the full effects of an increased monetary supply the minute confidence falters. This, I believe, is the real message the gold market has been telling us. The government is playing a confidence game with the bond markets. So far there have been no problems. The bond market remains lulled and complacent. Investors have been gripped by fear and inordinately focused on past events. They are staying in cash on the sidelines, or in what they think are cash substitutes, such as the bond markets. They are unwittingly ballooning the inflationary reservoirs. Like generals fighting the last war they are unaware of the war in front of them. Since central banks first figured out that they could resolve their 1970s inflationary problems by using the bond markets to finance their deficits, we have witnessed a credit expansion of biblical proportions. Many have referred to this as "the debt super cycle." Now this debt cycle is entering its end game. It could play out quickly or it could transpire gradually over time, ultimately resulting in hyperinflation. All great inflations start out gradually and build up steam. Once they begin, inflations require ever-more-inflationary expansion just to support their existing debt. And when it comes to debt there are only three ways to extinguish it: debt can be paid through increased taxes, it can be repudiated, or it can be inflated and diluted. As we have learned from Carmen M. Reinhardt and Kenneth Rogoff in their book This Time Is Different: Eight Centuries of Financial Folly, the favorite course of action pursued by politicians throughout history has been to inflate it away. The Fed has already alerted us to their future course of action: more inflation is needed. We already have the ingredients set in place for inflation to unfold. We have the creation of money. All that is needed is for velocity to follow. Inflation is a buy-now-pay–later scheme and the bills are coming due. The sequence of events is quantity leads and velocity follows. Now it is time to examine the evidence. We already know that a giant inflationary reservoir is ballooning in the bond market. Hard asset prices are rising, especially precious metals and commodities such as food. This is how all early inflations begin. The sequence is always the same. In The Great Wave: Price Revolutions and the Rhythm of History, historian David Hackett Fisher described how he found the same sequence in the development of inflationary cycles. They all begin in periods of prosperity and they all end in shattering world crises. They are all preceded by population growth. The inflation first surfaces in a demand and rise in price for life's necessities: food, shelter, and energy. The rapid price rises first appear in the price of food, shelter, and raw materials. We've seen the rise in shelter which is now in the process of deflating. We're seeing it occur in precious metals which have been rising double digits every year (in a controlled fashion). And we now see it appear in the cost of food. The full inflationary storm is being contained by the expanding bond market. 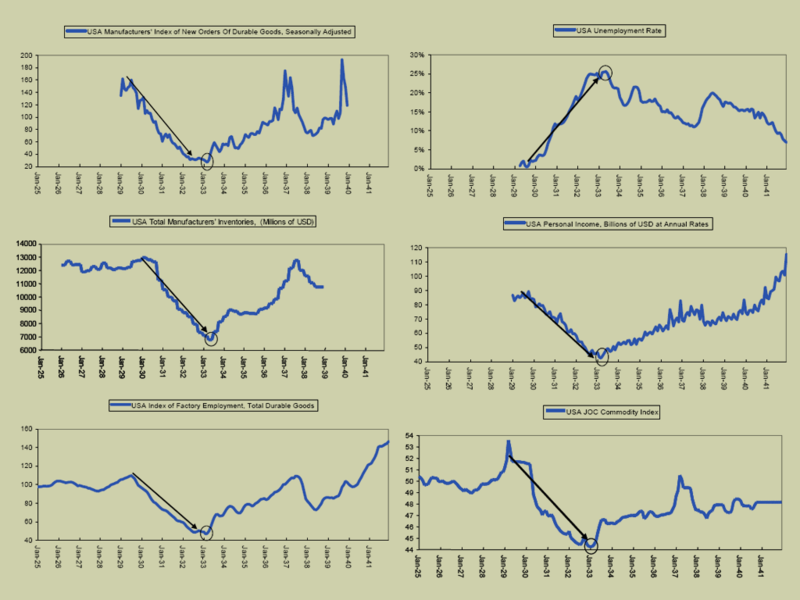 Contrary to what is widely believed, the Fed has not "run out of bullets" and they have told us so. The Fed can print as much money as it wants but few believe they will. They have already answered that question in the latest FOMC meeting. They want to see more inflation and they have the tools to bring it about. They could buy other assets such as stocks, bonds, and real estate. The government already owns Fannie and Freddie. They can lower bank reserve requirements, lower rates held on reserves, or penalize banks for not lending by charging a negative interest rate on deposits held at the Fed. Former Fed Vice Chairman Alan Blinder has already alluded to these options in a recent op-ed piece in the Wall Street Journal. Ultimately, they will end up using their most powerful weapon which is to devalue the dollar. 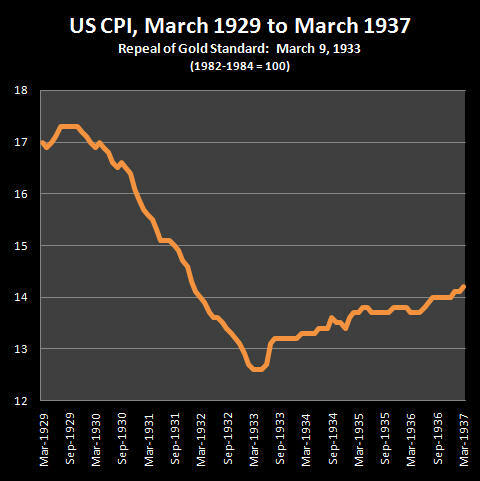 Roosevelt ended deflation overnight in 1933 by devaluing the dollar. As shown in the graph below, deflation immediately came to an end when he did so. It did not resurface until the monetary stimulus was withdrawn and taxes were raised to over 80% in 1936–1937. Money Master and Commander Bernanke has made numerous speeches saying he would never make that mistake. Now let's look as to some additional facts about deflation. The last serious bout of deflation other than the Great Depression occurred in 1949 under Truman when the CPI contracted by 2.1% year-over-year (yoy). We got another bout of deflation under Eisenhower in 1954 when the CPI fell by 0.7% yoy. Since then we have not experienced a bout of deflation, as it is commonly understood, by experiencing a falling CPI. Even during the credit crisis of 2008 we only experienced a brief bout of deflation between the months of August through November. (See CPI table "Consumer Price Index: All Urban Consumers.") By December 2008 the CPI began to rise. The Fed's money printing was doing its job and deflation was arrested in short order. Despite the credit crisis the yoy CPI change was 0.1 % for 2008. It was 2.1% for 2009. This year we're tracking at an annual rate of 2.7%. These CPI rates assume the government's numbers fully reflect the real cost of goods and services we experience in our daily lives. To believe them you must ignore geometric weighting, hedonic indexing of prices, substitutions, and owners' equivalent rent. I'll give them the benefit of the doubt, but I personally have seen no deflation. My new iPhone was cheaper than my first one. The price of LED-LCD TVs have come down, but that isn't deflation. That reflects productivity as the production of greater amount of goods help to drive down costs as fixed expenses are amortized over a greater number of units of production. When it comes to my daily expenses, my food bills are going up, my health insurance premiums just rose by 10%, my cable, phone and utility bills are all rising, and the price of the goods I buy have increased as a result of a hike in sales taxes. In summary, the cost of goods I need on a daily basis have all increased. The cost of things I don't need like a new TV, or a new iPhone have all gone down. These items are all discretionary. So despite all of the dire deflationary warnings given by deflationists with such assurance throughout this decade we have not seen deflation, with the exception of a few brief moments in 2008. What has transpired is that asset bubbles that were inflated with money and credit have deflated. When the tech bubble burst, we inflated again and another bubble was created in the housing and mortgage markets. When the housing and mortgage markets burst we inflated again. This current inflation is being manifested through the government bond market in the U.S. This is the final end game of decades of inflation. It will perhaps become the greatest asset bubble in history. For those who are thinking of Japan I would suggest you think of Argentina instead, because the U.S. today resembles and looks more like a "banana republic" than it does an exporting and manufacturing powerhouse. The U.S. in 2010 isn't the same country of the 1930s. The U.S. is no longer self-sufficient in capital, manufacturing, or energy. The nation still runs a sizeable trade deficit. Nearly $0.40 cents out of every dollar the government spends is borrowed and we import close to 70% of all of our energy needs in the form of raw energy or refined energy products. Over 50% of our outstanding debt is held by foreigners. This is a recipe for inflation if not hyperinflation—not deflation. So what markers may indicate the next wave of inflation has been triggered? It boils down to a matter of confidence. As I once wrote in my Perfect Financial Storm series, "There will come a day unlike any other day, an event unlike any other event and a crisis unlike any other crisis. It will emerge out of nowhere at a time no one expects. It will be an event that no one anticipates—a crisis that experts didn't foresee. It will be an exogenous event—a rogue wave." (Rogue Wave - Rogue Trader, 26 October 2000) What may that event be? It can be something no one expects. Perhaps on an uneventful day when no one is paying attention, commodity prices suddenly begin to rise, a bond auction goes bad, and it sets off a chain of events. Massive amounts of short-term debt needs to be rolled over and there aren't enough buyers. The Fed begins to monetize setting off a sequence of events similar to what we have seen recently in Greece. What I have tried to illustrate here is that when money is created it doesn't remain idle. It can go into goods and services causing price inflation or it can go into assets causing asset prices to inflate. It can also find its way into paper wealth—the biggest repository of inflation—until it is unleashed. There are two major perceptions about the future: one is an impending stock market crash and the other is a major deflationary wave which will buffet the US economy. I believe both are a chimera. Money flows to where it is best treated by either higher returns or lower taxation. It never remains idle; it will always find an outlet to express itself. Money is a living, moving, and mobile organism that never sleeps.